Spatial distribution of the 298 spectroscopically confirmed PNs in the halo of M87, color coded according to their VLOS and their size scaled according to their probability to belong to the smooth halo. The center of M87 is shown by the black circle, and the photometric major axis of the galaxy by the dashed line. Credit: Longobardi et al., 2018. Astronomers have carried out a study of almost 300 hundred planetary nebulae in the supergiant elliptical galaxy Messier 87. The new research, published September 27 on the arXiv pre-print repository, reveals essential information about the galaxy's outer halo and its subcomponents. Located some 53.5 million light years away in the constellation Virgo, Messier 87, or M87 for short (also designated NGC 4486) is one of the most massive galaxies in the local universe. Its halo extends to a radius of about 650,000 light years. Astronomers are interested in studies of outer halos of local massive galaxies as they may contain the fossil records of the accretions events in form of kinematic substructures. In giant galaxies like M87, planetary nebulae are often used to find such structures, given that they can serve as discrete tracers of kinematic decomposition. Recently, a group of researchers led by Alessia Longobardi of Peking University in Beijing, China, has conducted a kinematics study of planetary nebulae in M87 in order to identify subcomponents of the galaxy's outermost regions. Their sample includes 298 planetary nebulae. 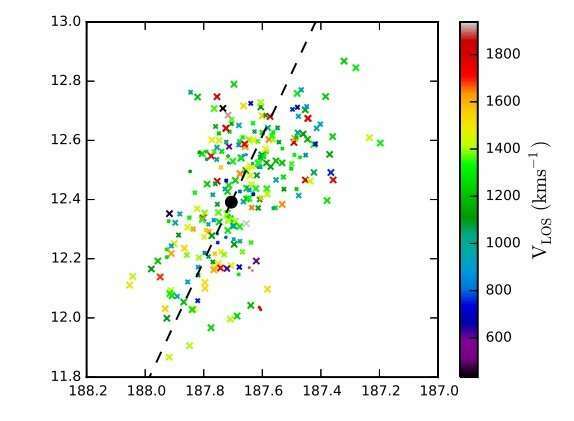 For the research, the astronomers used Gaussian mixture modeling for statistically separating distinct velocity components and identifying the smooth halo component, its unrelaxed substructures, and the intra-cluster planetary nebulae. "The goals of this paper are to identify the PNs [planetary nebulae] in the smooth M87 halo, using accurate velocities and following the approach of Longobardi et al. (2015a). We work with the sample of 253 PNs M87 halo PNs and the 45 intracluster (IC) PNs, for which line-of-sight velocities (LOSVs) are available with an estimated median velocity accuracy of 4.2 km/s," the paper reads. The LOSVs of the studied planetary nebulae allowed the researchers to identify subcomponents and to measure the angular momentum content of the main M87 halo. Furthermore, the research resulted in constraining the orbital distribution of the stars at the galaxy's outermost regions. In particular, the researchers identified several subcomponents: the intracluster planetary nebulae (ICPNs), the "crown" accretion event (in the so-called "crown" substructure), and the smooth M87 halo. The study found that the intracluster stars have a strongly non-Gaussian line-of-sight velocity distribution (LOSVD) with a peak at that velocity, and strong, asymmetric wings. Moreover, the shape of this LOSVD is consistent with that of the galaxies in the Virgo subcluster A, which suggests the ongoing build-up of the Virgo cluster. The researchers also made important conclusions regarding the smooth halo of M87. They assume that this halo steepens beyond the radius of about 195,000 light years and becomes strongly radially anisotropic. The authors of the paper added that the velocity dispersion profile is consistent with the X-ray circular velocity curve at that radius without non-thermal pressure effects. The X-ray circular velocity curve rises steeply outside about 97,500 light years, reaching 700 km/s at 652,000 light years.